Shutter is pretty much everything I could want in a book and then some. From the second I learned the premise, I knew I had to have it and I couldn’t wait to read it! It has demons, demon hunters, Van Helsing descendants, Dracula mythology and some amazing characters! I really loved the world that Courtney Alameda created, as a whole. Kennedy was an awesome character! For some reason, he kind of reminded me of Finnick from Hunger Games. He was a good little soldier who just wanted to do what was right. And even though I 100% shipped Micheline and Ryder, there was a small part of me that could completely see Micheline and Kennedy together. Another character worth mentioning is Bianca. She was one tough cookie and I wish we could have learned more about her. The camera aspect of the book was really intriguing and unique, though some of the technical stuff went right over my head. It definitely added to the story and I don’t think the book could have worked without it, but I just had trouble understanding some of it. The idea of the soulchain curse was so interesting, though! It kind of reminded me of the old AOL days when you’d send chain mail to all your friends, “Send this to 15 people within the hour or you’ll be cursed with bad luck for the next 20 years.” I don’t know if anyone else felt that way … Or if I’m dating myself here and half of you don’t even know what AOL is…. But it’s all I could think about as I read! The ending was crazy intense. The Obscura was creepy and reminded me of the Netherworld in Rachel Vincent’s Soul Screamers books. I guessed who the entity was fairly early on, but my theories on the entity’s motives were only half right. Still, even with guessing the big twist early on, I still loved the ending and how crazy, intense and epic it was. I only had a few minor issues with Shutter. The pace slowed down a lot in Night Three. I had to really push myself to read this section. However, Night Four really picks up in speed and intensity. As I mentioned earlier, some of the technological mumbo jumbo with the cameras went over my head, though the camera aspect was awesome and I loved how it made the book unique. 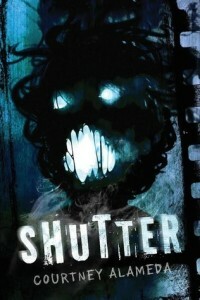 Finally, I’m a horror buff and I had heard Shutter was seriously creepy. I’m a tough nut to crack when it comes to horror. Not much makes me jump, so I wasn’t as creeped out by Shutter as I’d hoped to be. There were definitely some disgusting scenes that made me shudder and the cover for sure creeps me out. So, I would have liked to see.. more, but again, I LOVE horror and not much creeps me out. I’ve spoken to others who couldn’t even read Shutter at night because it creeped them out so much! Overall, not only did Shutter meet my expectations, it exceeded them. I loved the characters, the world, the explanations/mythology and pretty much everything about this book. I had a few slight issues, but they didn’t effect my feelings on the book or my rating at all. I’m crossing my fingers this is a series because I’m desperate to explore this world more. I want to learn more about the various species of necros and I want to learn more about the characters. I want to see more of the back-story and discover more about Luca and what his presence means for Helsing Corps. Really, I just want to read another Courtney Alameda book. I definitely think she’s an author to watch out for. I can’t wait to see what she does next! I think I'm going to love all the characters. I have a really good time with characters that are hard on the outside but deeper on the inside because I can find it reminiscent in me! I’m way behind on replying to comments.. But yet! It’s in stores now :) At this point, have you gotten to read it? You’re review is great, but no matter how awesome this book is- I CAN’T FATHOM BUYING IT OR READING IT BECAUSE THE COVER IS SO DISTRACTINGLY HIDEOUS!Seriously- great review…I just can’t, lol. I know! I love horror and creepy things and even I’m creeped out by the cover! YESSS!! I’m so happy to hear you loved this one Meredith!! I’m a total wuss so this one was creepy but not scary for me, so I can understand that it didn’t creep you out so much. As an amateur photographer I simply adored all the mumbo jumbo about the cameras and lenses and things, but I can understand it might have been a bit “wha?” for other people. And Ryder… oh boy, how I ship those two!! *flails* And I guessed who Luca was very early on, and the entity, well I suspected but was hoping for someone different because of the heartache, but I feel the resolution was quite awesome. I hope we’re getting a sequel too!! I totally loved it! I just wanted MORE with the creepy! Le sigh. Let’s hope we get a book two and it has more creepy AND more Ryder! That’s a win/win!